'Tis the season and we're in trouble. Thora is ten months old and there's no escaping the holiday spirit no matter how hard this Grinch tries. Plus, it's freezing cold which makes me want to stay home and make hot chocolate and play jazz music and do jigsaw puzzles and laugh with my baby and my husband but life goes on and so must I. We spent one day of Hanukkah with our dearest friends who have two delightful children. The kids all exchanged gifts and Thora totally lucked out with a backpack, a nifty veterinarian's "bag" with keys and a stethoscope and lots of other fun things to stick behind little doors and lock and unlock, and a Melissa & Doug puzzle that looked a lot like the one belonging to their daughter that Thora had been eyeing the whole day. We lit candles and I pretended I didn't know the blessing in Hebrew because I was shy in front of my goyische husband and then I teased him for not knowing you eat latkes with applesauce and (vegan) sour cream. Then one day we came home to a box addressed to Thora full of individually wrapped Hanukkah gifts from her Grandma. There were ribbons and bows! There were sparkles! There were presents hidden inside presents! We discovered a box with Thora's name on it in red glitter letters, a set of plates, bowls and cups, a technicolor Uglydoll, new Trompette socks, a personalized book about bees, a bath toy, a book with moving pictures of animals, and more. We had a blast helping her open it all and make a big happy mess. And that was Hanukkah. Easy! Holidays really haven't been that stressful for me historically since I only partake in ways that are easy. I've never been a dedicated participant and truthfully I have never been much of a holiday giver. Having a child has changed my views on gift-giving and this year was a little different than most in that we decided to anonymously help a local child. I heard a report on NPR that talked about the physical and psychological benefits of giving, and how giving feels better than getting. I tried that one on for size. We investigated our options and found that the Harlem YMCA had an program to help families in the neighborhood. Children came and decorated ornaments shaped like paper angels and on the back they wrote their gender, their age, and the gift they wanted. Johnny was in charge of this project. Video game fan that he is, he bypassed angels asking for shoes or pants or coats and came home with glittery angels decorated by twin ten year old girls who each wanted a Nintendo DS! "Imagine these little girls who have so little... we'll get them each a Nintendo DS in metallic pink!" That wasn't exactly what I had in mind but Johnny talked me into it and we even agreed to adjust our gift budgets for each other to make it work. And NPR was right. We had such fun picking them out, wrapping them and bringing them back to the YMCA. I was about to sneak a few more angels, to provide a child with the pants or shoes they really needed more than these girls needed their Nintendos, but by then most of the other angels had been taken off the tree and all that was left was the lone "boy, nine, digital camera" and the even more ambitious "boy, fourteen, laptop" that were going to have to happen without our help. We were proud of ourselves for doing what we could and I know we will continue to do this every year. The most stressful thing of all for me is trying my darnedest not to offend anyone who cares deeply about the holidays. We have family, for example, who are among the sweetest, most generous people I know and they are dying to buy Thora tons of gifts for Christmas. I am the sourpuss who worries that people spend money on us that they could be spending on other things instead of getting into the spirit of the holidays and accepting their generosity and kindness for what it is. So, they asked for a list. And what did I do? I gave them a list so specific that I am quite sure I took all the fun out of shopping for her. We squelched all their ideas. "No, she doesn't need any clothes or any books. No, please don't buy her Uggs, we are vegan and we don't wear leather or wool. And please, no plastic Fisher Price stuff!" Then we focused on the positive. "Haba toys please," we said. "Plain wooden things. Blocks. Videos are okay but only Pixar or Muppets or Sesame Street!" we said. Then I started to feel guilty about this because I don't want to seem ungrateful for their kind thoughts and well, because Thora truly loves plastic toys. She loves them. They have infiltrated our apartment in fits and starts despite our best efforts to the contrary. She loves her weird mirror that sings jazzy songs and plays instruments as she presses on their big primary-colored smiling faces, her big plastic book that sings nursery rhymes that get stuck in our heads so that we're humming "Hey Diddle Diddle" late at night when she's long asleep, and a handful of other things I would never have chosen but have come to love too. So finally - six days before the holiday - I changed my tune and said "Anything you want is fine!" Too little too late, to be sure, but the truth. She will love whatever she gets and therefore, so will we. Unlike me, Thora is blissfully unaware of the approaching holiday. Every day is a holiday to her. It's entirely due to Johnny's insistence that she will have stuff to open on Christmas. But we needed her help. So we racked up a ton of little things that she helped pick out. We wandered through the gift shops at the Museum of Natural History, letting her select a pink glittery ball that lights up when bounced and a strange gooey wormy thing with a soft plastic fringe and big googley eyes. We went to a small children's store on the Upper West Side that benefits the Children's Aid Society. There, Johnny picked out a little purse shaped like a lion made of all recycled materials. I picked out a mauve hair bow. Thora picked out a green ball with ladybugs. We found a toy store we hadn't been to yet and bought her another Melissa & Doug puzzle and a toy car. We went to a different toy store that we'd been to a million times and bought her a small wooden truck with wheels (baby's first mobile clinic?). Next year we will be experts at this parenting thing (we will, right?) so it will be much easier to pick out her toys on our own and not worry that she will freak out when a new beloved toy disappears for a few weeks. This year we waited until she was asleep and then gathered up the things she'd already unwrapped or played with or chewed or slobbered on and wrapped them. She didn't seem to notice they were gone. And won't she be surprised when she finds them all again on Christmas! Nah, she won't care. Thora's got a lot of stuff going on, too much to notice the comings and goings of presents and such. Food is her main focus. She is an exceptionally good eater. Yesterday she ate tofu scramble, sweet potatoes, kale, brown rice and pinto beans, nutritional yeast-based gravy. And right now she's in a stage where everything is her toy. Her toothbrush is her favorite thing ever. She squeals with delight when I hand her the toothbrush and brushes her two teeth diligently all by herself. She loves cat toys. The cats. Paper. The stroller wheels. The furniture. Her two top teeth are coming in now, so in addition to having the world's best appetite, she gnaws on everything she can cram in her mouth. This week we were traveling. Our flight out of New York was delayed, which was annoying mostly because there was no Starbucks in the terminal to keep us busy but also because Thora did not nap and was thus overtired and especially un-containable. 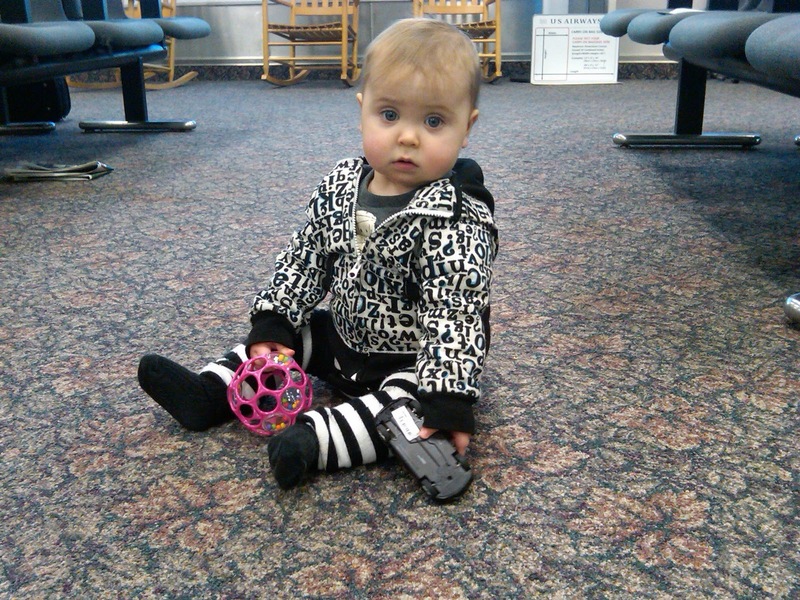 She wiggled and giggled and wriggled and wraggled and squirmed all over the seats, the seat legs, the carpet, and the people at Gate 4. Desperate, I made a discovery. Cookies will keep your baby busy and quiet. 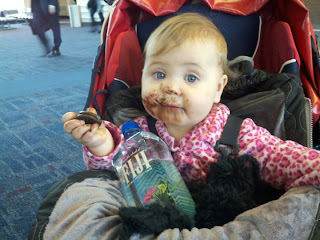 Thora worked her way through two disgustingly sugary "healthy" Oreo-style cookies, eliciting a lot of "Awwww"s from our seatmates and a lot of "Eeewww"s from me, as both she and I were soon covered with brown smears. I will say that the cookies kept her busy and quiet until we got on the plane, at which point the sugar rush and the lack of nap made her fussy and wriggly for the entire flight (but quiet), so luckily she annoyed no one but her daddy and me. On the way home, I was prepared. She napped in the car on the way to the airport. We were early, so we sat in the parked rental car in the returns lot for as long as we could stand it before waking her up and entering the terminal. I had snacks and cookies and toys. We were early so we had lots of space. Still, people gravitated towards us. A lady in a wheelchair, a retired couple, a student, a few other people, all full of "Awwws" were all enthusiastically watching her every move (and mine, and Johnny's, as we crawled around the airport floor chasing her) when she stood up, cookie in hand. 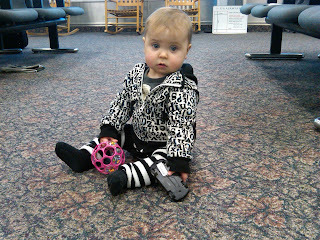 She held the slimy, chocolately mass out to me to share and took two steps on her own, for the first time ever, in the tiny Asheville airport while all the travelers held their collective breath. A moment later she plopped down on her bottom, still holding the cookie out to me. Johnny and I both wiped away a tear. "Did you see that?" I exclaimed. "Uh-oh," said Thora's audience. "Now you're really in trouble!" I love keeping up with you guys. She gets more adorable with every post. I hope, and think you will be better at sticking to your guns with the kinds of toys that infiltrate your home. Just last night I found myself putting a baby doll with its own booster and jars of baby food, plus a little baby medical kit (so Anna can administer medicine) into my cart, wondering who the hell I was and where all my "I'm not buying into gender stereotypes with MY baby" went. But my girl loves caring for her babies, and so, babies she will have. (Tell Me What Inclusion Looks Like!) This Is What Inclusion Looks Like! Awesome Inc. theme. Theme images by rusm. Powered by Blogger.